Ramona Lindsey joined the Mission & Impact team as the Special Projects Coordinator in July 2017 and became a Program Officer in March 2018. She brings with her an artistic and visionary background to help coordinate, design, develop, implement and manage Foundation projects. Her most recent work experience has been at KMAC Museum as their Director of Education and as a Museum Educator. She enjoys collaborating with arts initiatives as a textile and public artist. More specifically, she was the lead artist for the Center for Neighborhoods P.A.I.N.T Project: Parkland Rising. She was also the co-founder and president for the West Louisville Women’s Collaborative, Inc. – a 501(c)3 whose mission is to create and sustain artistic peaceful spaces in West Louisville. 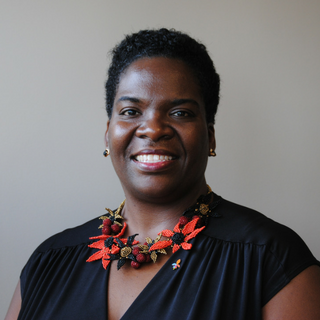 A Louisville native, Ramona advocates for responsible, community-focused land use as a commissioner on the Metro Louisville Planning Commission and develops public art addressing the issue of vacant and abandoned properties in urban neighborhoods. Ramona began her career in retail banking before transitioning into public education. She obtained a B.S. in Business Administration from Florida A & M University and a M.A.T. in Elementary Education from Spalding University.